The Batanghari River is the longest on the island of Sumatra, around 500 miles in length. The source of the river is from the far western mountain range in the Jambi Province, known as the Bukit Barisan (row of hills). 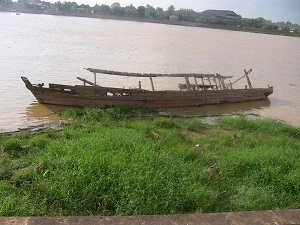 Dilapidated boat resting on the bank of the Batang Hari River. We made the below video to show the various uses of the Batanghari River.